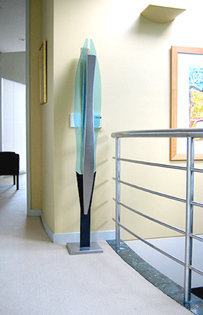 'Falling Angel III' is a sinuous stainless steel sculpture. As you can see from the images, this sculpture suits indoor and garden environment. In the second image, you can see that this sculpture was designed to have a smooth, strong vertical flow of steel and glass.